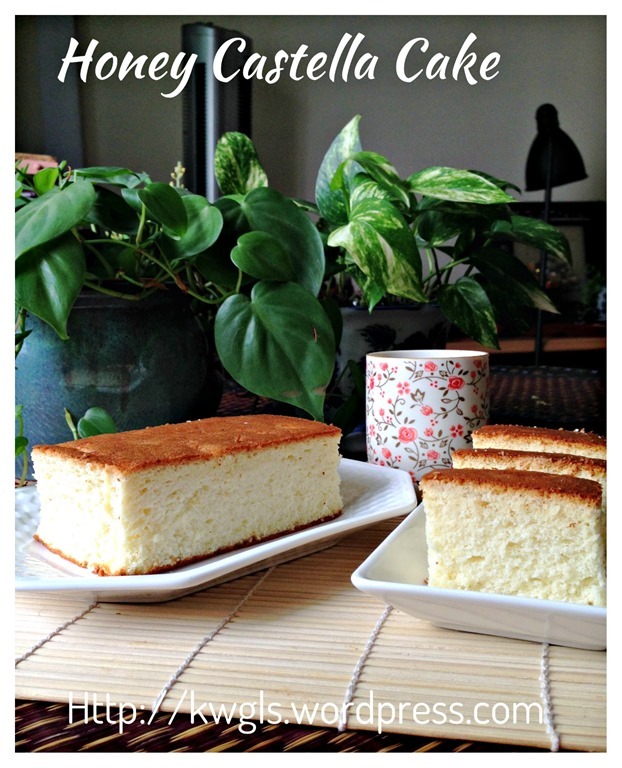 Very frankly, I have never tasted a piece of Castella cake or Japanese Kasutera honey sponge cake before. However, the pictures in the internet always captured my attention.. It looks like a moist, dense but tasty cake.. 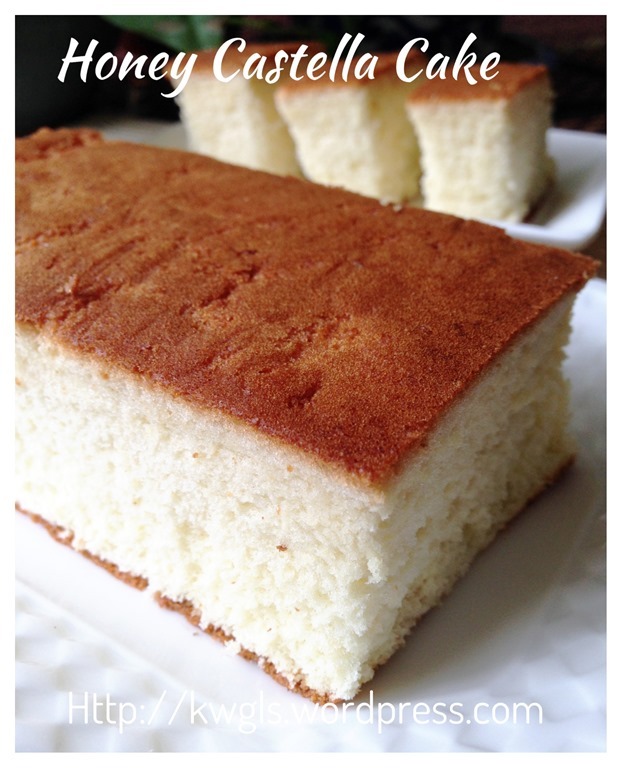 I goggled the recipes and most recipes are the same using small quantities of honey, eggs, bread flour and sugar. 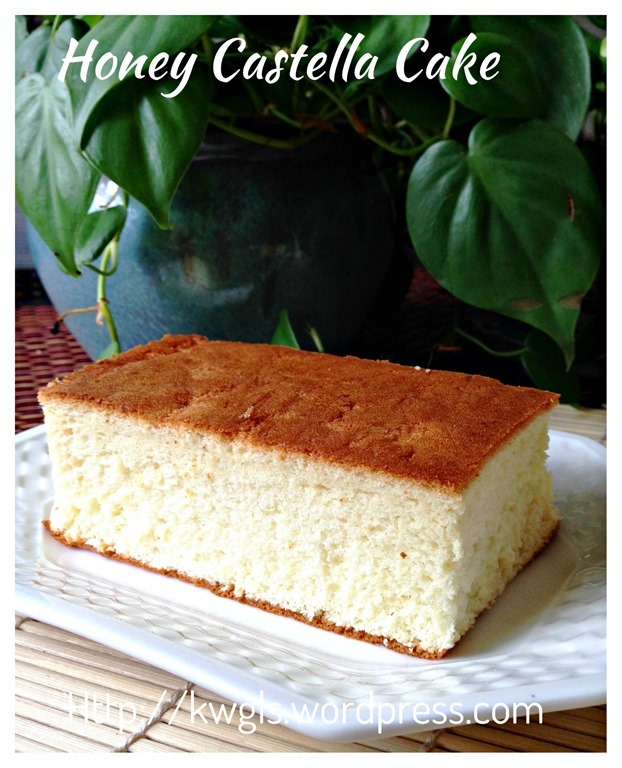 No oil are used and it does fall under the western cake categorization of “sponge cake”.. Since most of the recipes are the same, I took one from the Japanese Cook pad.com and started baking it.. It came out a nice cake.. 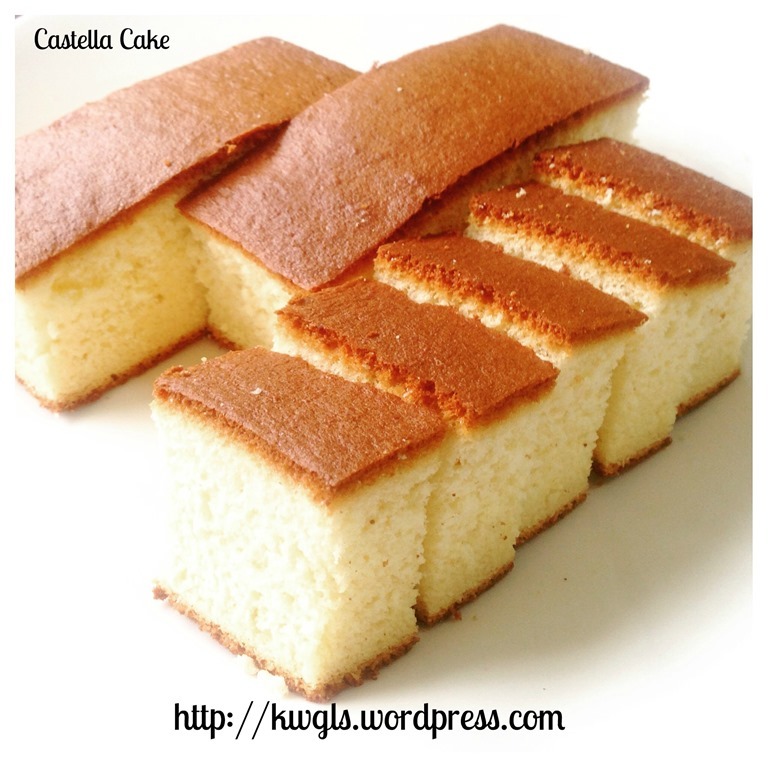 However, I do not know why it doesn’t look like the picture of commercially sold Castella cakes.. Apparently, it is not as compact but fluffier. 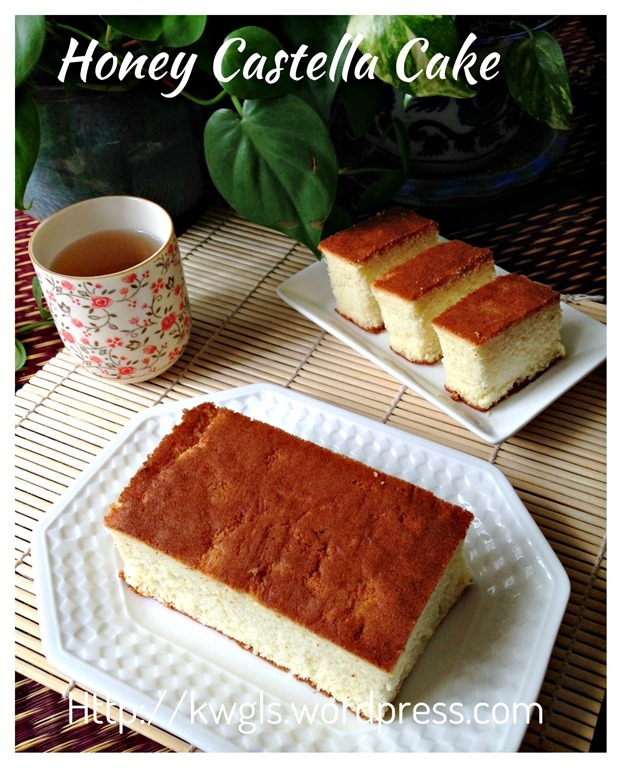 That lead me to believe that commercially sold Castella definitely have a different recipe from the common recipes circulating in the internet..
Use of traditional wooden frame for baking and normal baking pan are too hot for the cake; . 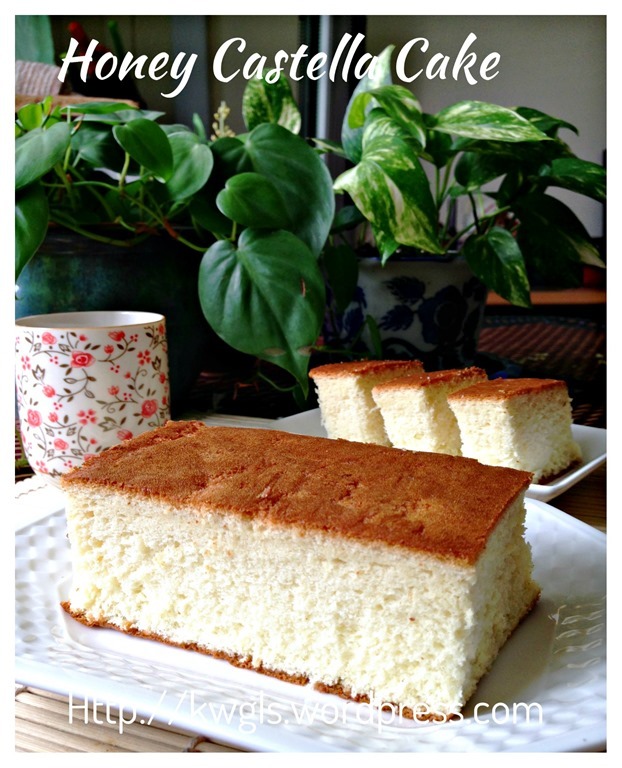 Use of water bath method to enhance the moistures of the cake? There are just too many possibilities for me to guess and try out.. Of course the answer will not be easily available since it will definitely be considered as a trade secret among the industry players. 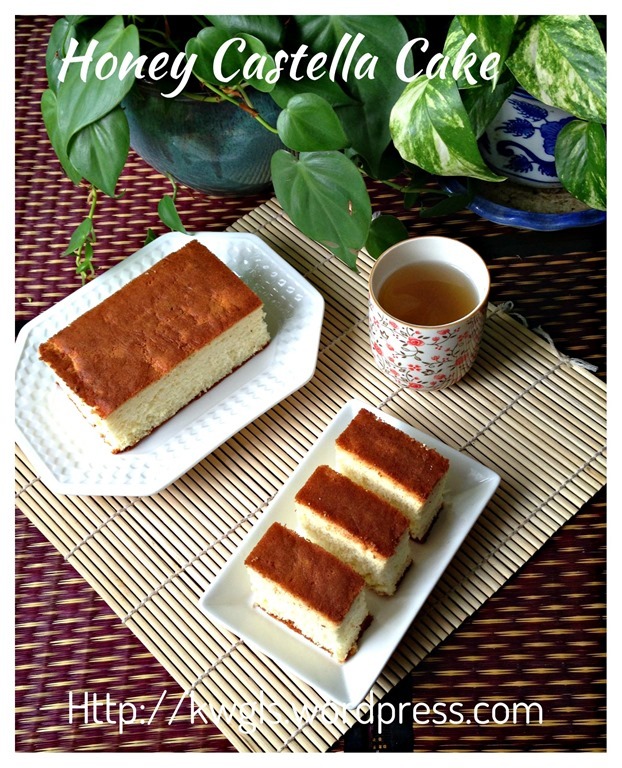 Updated: After issuance of this post, subsequent reviews of recipes in Chinese blogs shows that there are many modified version and most versions have added melted butter, milk and use of low protein powder. Some have added ovalette at all As such it looks different from this illustration. Again this illustration is based on traditional recipes that do not have any fats and milk that falls under sponge cake categorization. 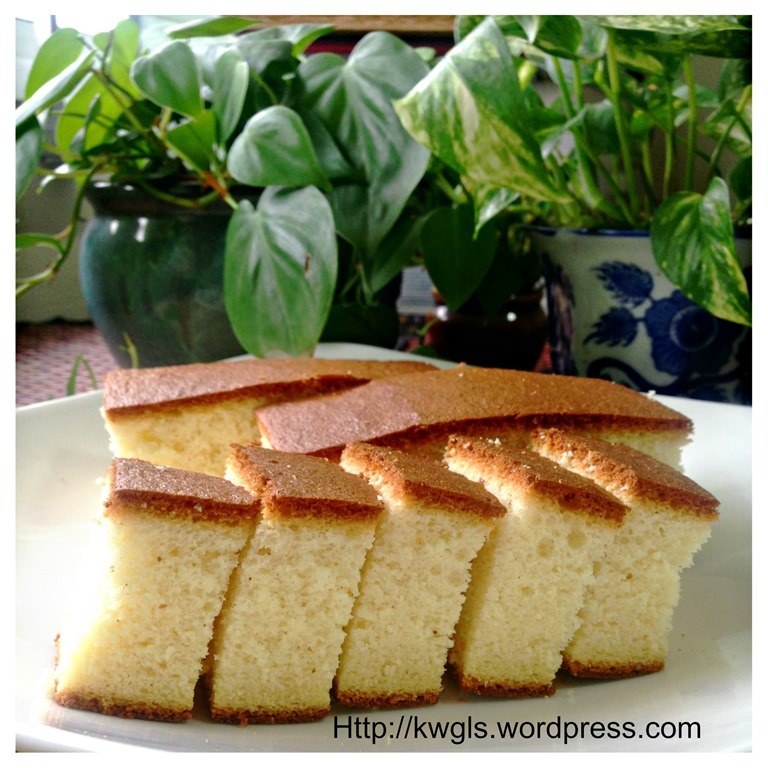 Those that uses butter will become a mix of shortened cake and sponge cake. Greased the pan lightly and line the baking pan with parchment paper. Put the mirin and honey in a microwavable bowl, microwave for 10 seconds or until the honey dissolves in the warm mirin. 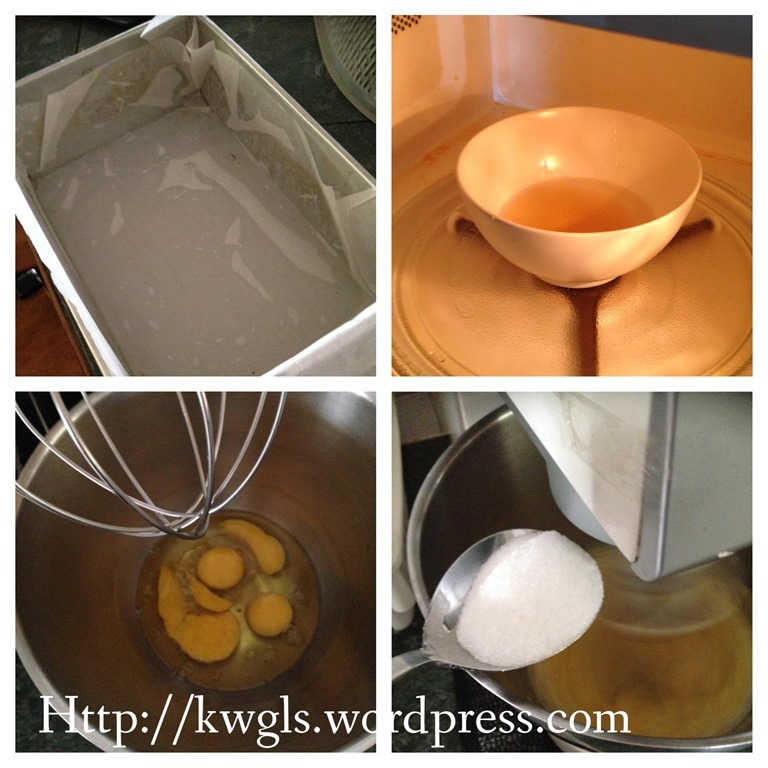 Crack the eggs in a mixing bowl of a stand mixer, beat at medium speed until bubbly. Add sugar tablespoon by tablespoon. Continue beating at high speed until the egg batter expands to at least double in size and form ribbon stage (took about 10 minutes). Ribbon stage means when you took out the whisker, the egg batter drips down slowly rather than flows down rapidly. 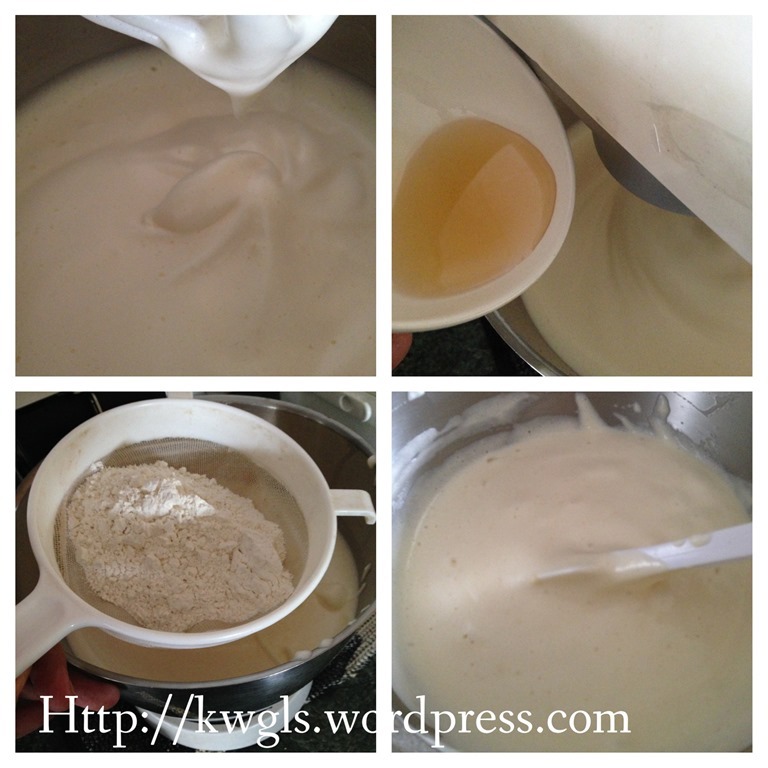 Add the warm honey mixture gradually and use the mixer’s lowest speed to “beat” for 30 seconds until well combined. Sift in 1/3 of the bread flour, fold quickly until well combined. Perform the same for the remaining 2/3 of the bread flour. Fold until well combined and no lumps noted. Pour the batter to the baking tin from as high as possible to minimize trapped air bubbles. Tap the baking tin three times on the table to push out any trapped air bubbles. Put the baking tin to the oven, reduce the temperature to 170 degree Celsius and bake for 10 minutes. After 10 minutes, reduce the temperature to 140 degree Celsius and continue baking for another 40 minutes. 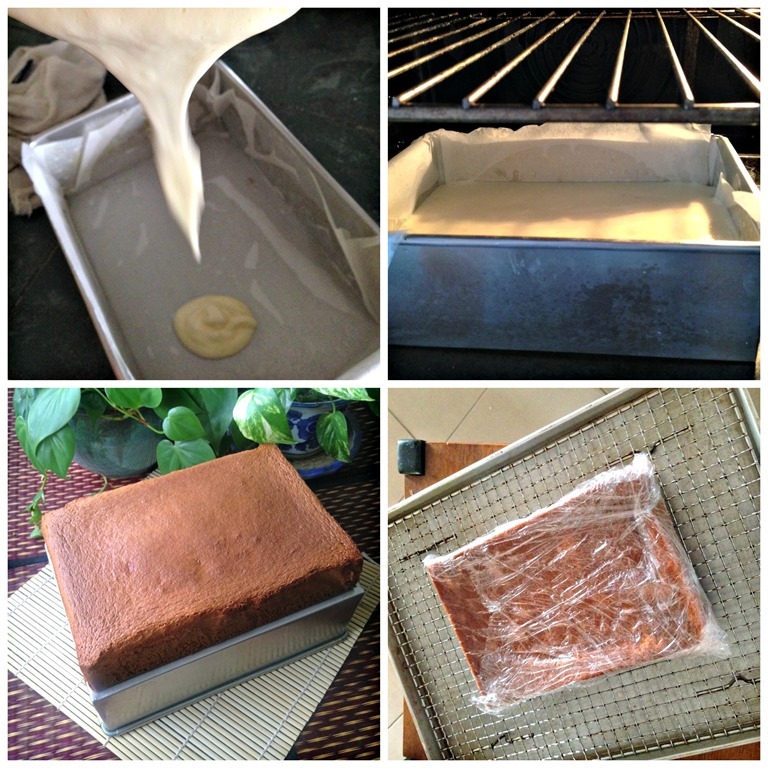 For a moist and denser cake, once the cake is out of oven, take out the cake and wrap with a piece of clingy wrap. Leave it in room temperature for 1-2 days. Cut using a sharp serrated knife. 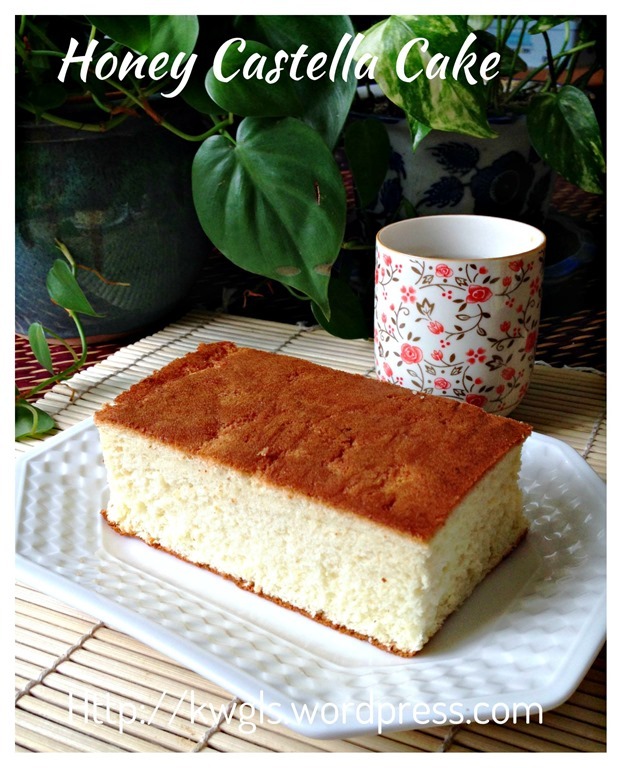 Traditional Castella are prepared using special wooden frame. It is believed that normal baking tin is too hot for this cake. To ensure even rising, you can try to wrap a wet towel around the baking tin and continue baking. Alternatively, there are bakers who use paper boxes, wrapped it with 2 layers of aluminium foils followed by lining with parchment paper. If you prefer, you can try this method. This recipe’s temperature will ensure quite even browning. However, if your top browns too quickly, quickly put some aluminium foil on top of the baking tin. 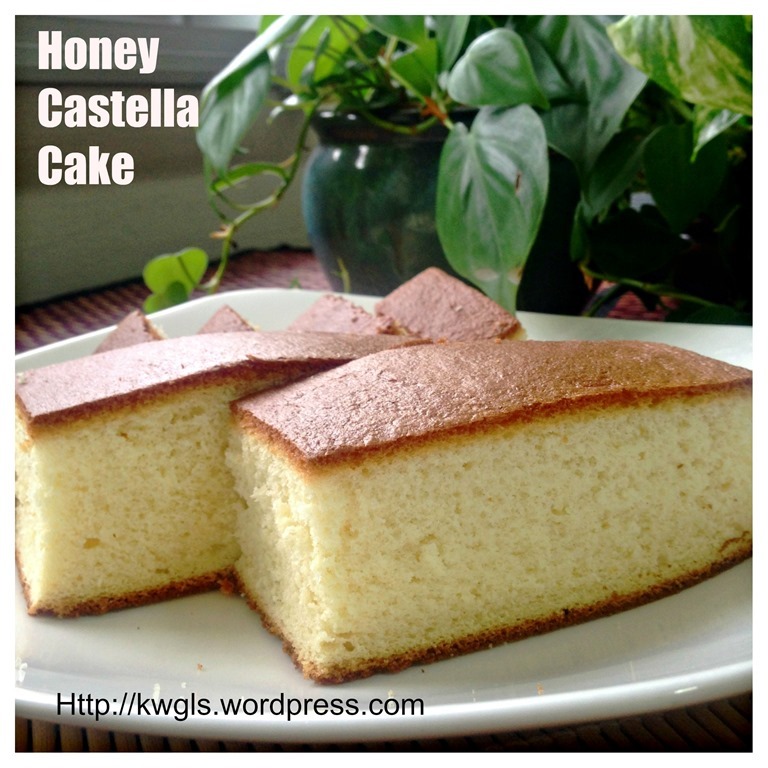 Again, I am unsure how you viewed my Castella cake. 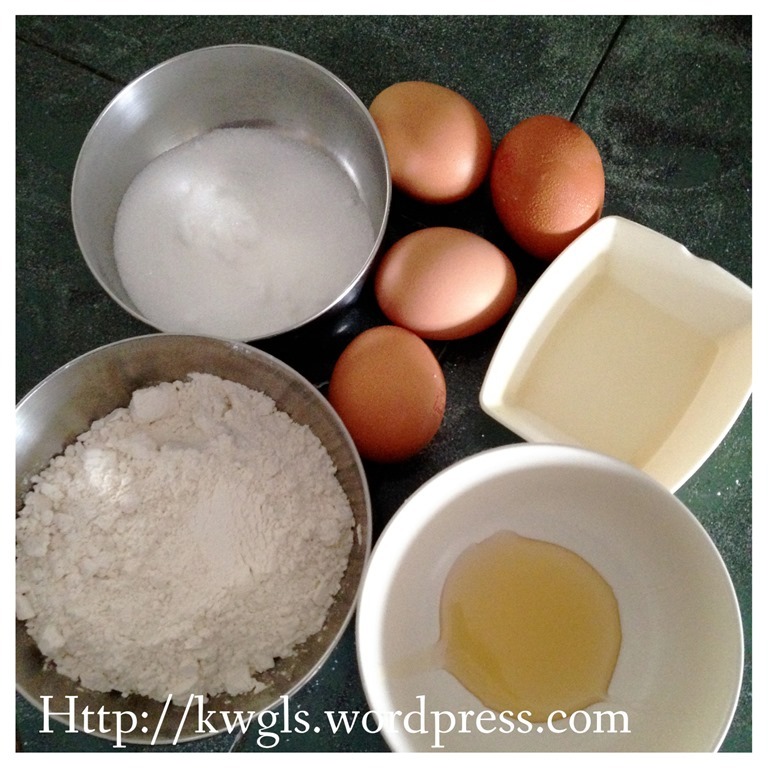 If you considered as successful, I can tell you it is not a difficult cake to prepare. The critical areas are egg beating until ribbon stage and folding to well mixed.. 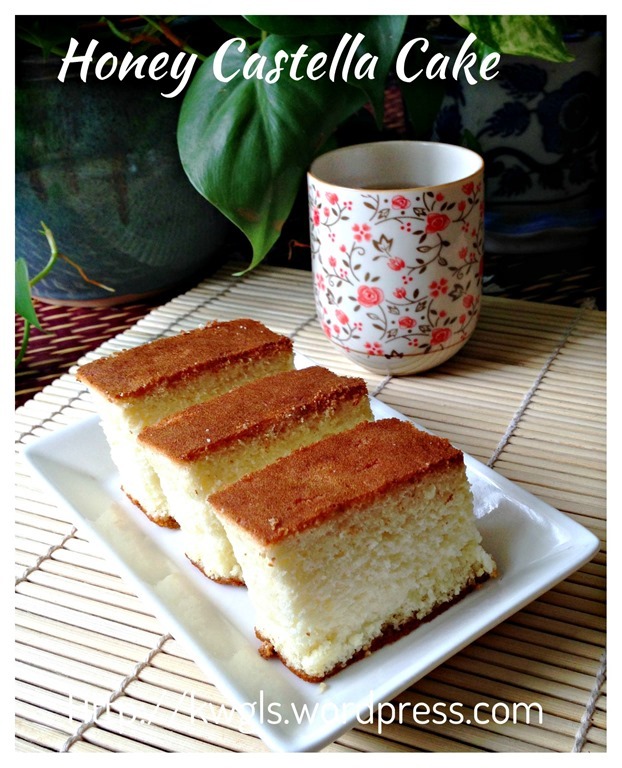 I will update the recipe if I managed to find one that is different and worth trying..Lastly, not forgetting to mention that this is a very healthy oil less cake full of Mirin and honey flavour… No Mirin, no worry, substitute with fresh milk will do. 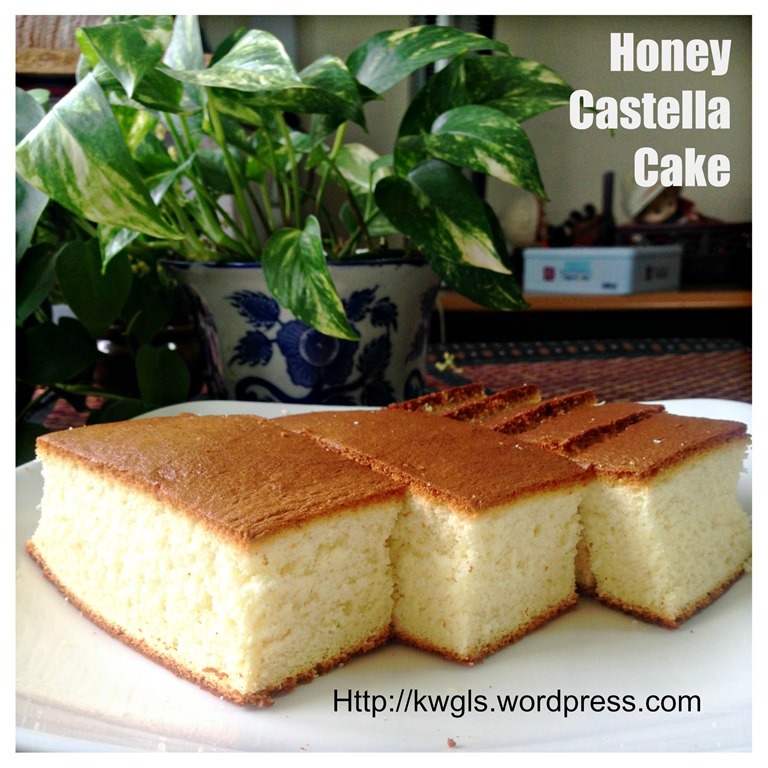 This entry was posted in Cakes and cookies, Chinese and Asian Cakes and Snacks, Food Preparation Series and tagged 8, カステラ, Castella, 长崎蛋糕, GUAI SHU SHU, Guaishushu, Kasutera, kenneth goh, Pão de Castela, postaday. Bookmark the permalink. – Should we bake this in medium or lower tray in the oven? – Oven on fan mode or conventional mode? – Do we wrap baked cake in clingy wrap immediately once it’s out of the oven or wait till cool?